Man, it sure is hot here in Tennessee. But I want to put to rest right here the myth that “dry heat” is somehow superior to humidity. I believe I am qualified to decide this issue, because I currently live somewhere where it’s humid, and before this, lived most of my life in the “dry heat.” As I sit here in east Tennessee, my atomic clock/weather station says it is 97.1 F with 49% humidity. I was just outside filling the horses’ water bucket, and it’s darn hot. The humidity has been much higher, and it was very, very uncomfortable. However, 120 F, dry or not, is much worse, believe me. Besides, ask a Phoenician how dry it is in Phoenix right now. They have what’s called the “monsoon” season, when the temp drops down to a balmy 110 or so, and the humidity hikes up to 50% or higher. Nasty. Anyway, that’s not my real topic today. My real topic is heat and horses. My poor horses can’t fit in my air-conditioned house (don’t think I wouldn’t try if I thought they could), so they have to battle the heat in their own ways. Luckily, our pasture has a lot of wooded areas and is mostly surrounded by trees, so they have lots of shade. We make sure they always have lots of fresh clean water (which isn’t easy, given their habit of backwashing grassy water into the bucket all day). I cannot stress enough the importance of making sure your horse has plenty of water! Our horses sweat A LOT, so of course they need to keep rehydrating. From how many times I refill their tub (plus the buckets of water they have in their stalls at night), I believe they are drinking about 30 gallons of water a day between the two of them. But that’s okay, they have unlimited refills here. And there’s always the pond, if they feel like a dip. They’d have to be pretty desperate, though, because our pond would be better described as a rather deep mudhole. But they’ve been in it before and could again. 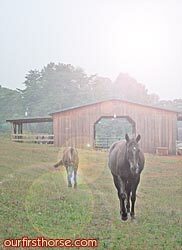 Some people like to leave their horses in the barn all day and let them graze at night, when it’s cooler. We decided against that for several reasons. One, there isn’t much ventilation in the barn, so it would probably be less comfortable in there for them than it is out in the pasture (barn fans would help, of course). Two, we have wildlife here, including coyotes and bears, and I think the horses would be (or at least feel) safer in the barn at night. Three, we just feel better having them wander around in the daytime rather than at night. We’re overprotective parents. There is one good reason, however, for the reverse schedule, and every time I see my formerly black horses I think that maybe we should have taken that advice. They are, indeed, bleached blondes. Well, at least brunettes. With lovely red mud highlights.